The ancient city of Teotihuacan is the most visited of Mexico’s archaeological sites and a must-see if you’re in Mexico City. The site is impressive for its scale, both in the size of the Pyramid of the Sun (the third largest pyramid in the world) and the majesty of the Calle de los Muertos (Street of the Dead) – originally 4km long and flanked by temples, palaces and platforms. Look for amazingly well preserved murals in the Palace of the Jaguars or the Palace of the Quetzal-butterfly and bold sculptures in the Temple of Quetzalcoatl. Bearing the above in mind, bring some water (the refreshment stalls are quite a distance from the pyramids) a sunhat, camera, guidebook – but little else to drag around. As usual it’s best to arrive early in the morning or towards the end of the day to avoid the crowds or the heat (morning is best in summer, when rainfall is more common in the afternoon). Most of the tour buses have an annoying habit of starting out early in the morning but then stopping at other less strenuous sights on the way, and/or calling in at a souvenir shop before the site, so that you finally arrive around noon. Note that in winter it can actually be quite cool (even if it is warm in the city), and a sweater is recommended. You’ll find a visitors’ complex with restaurant, toilets and shops at the entrance near the citadel. There’s also a museum housing a scale model of the city at its peak – well worth a look before or after your visit. By bus – Autobuses Teotihuacan leave the North bus station every half an hour or so. Check that your bus goes to the site entrance and not just to the town of San Juan Teotihuacan nearby. It will take around an hour, and the buses run until about 6:00pm – check the last departure before you leave. 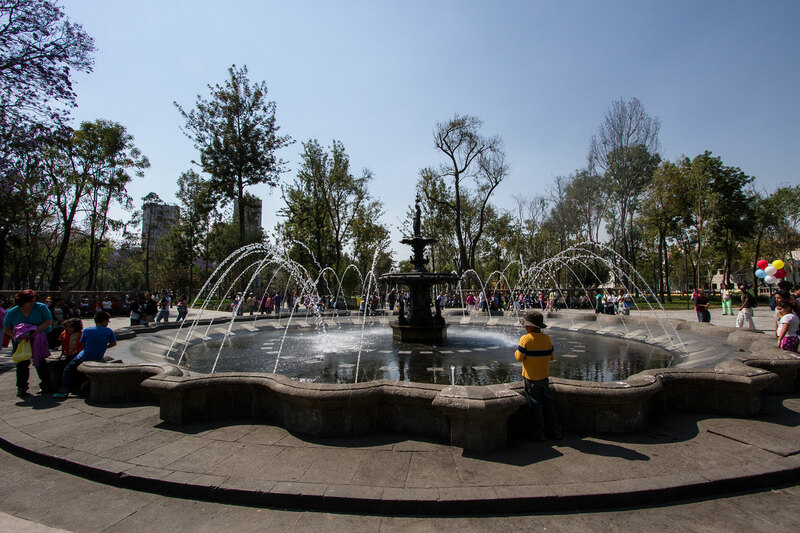 By tour bus – most travel agencies offer half or full day tours to the site, often combined with the Plaza de la Tres Culturas and the Basilica of Guadalupe, both of which are outside the city center. It’s a convenient way to combine the three, but note our comments above about getting to the site early. 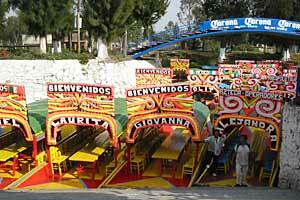 The price for the tour and transportation is around 500 pesos (50 USD) per person. By car (or taxi) – it will take about 45 minutes from the city center if you use the toll motorway, much longer if you use the old free road. There is a small fee for parking at the site. Private tours with a car and driver/guide can be arranged at most hotels for a reasonable fee if you want the convenience (for a family it may work out less expensive than taking a tour). Teotihuacan was a large settlement by 150BC, its importance probably arising from a cave system with religious significance, located underneath the present day Pyramid of the Sun. As other settlements in the area diminished, Teotihuacan flourished and became a religious and economic center, controlling the region’s production of obsidian (the black stone used to make weapons and utensils). Between 1AD and 250AD the ceremonial core was completed, including the Pyramids of the Sun and Moon and the Calle de los Muertos. The massive pyramid structures were painted red and must have been an awe-inspiring sight. Trading relationships were established with Monte Alban in Oaxaca and the gulf coast – there is little evidence of any hostility during the years of prosperity. (You will not see any depictions of warfare or human sacrifice in the carvings and murals at Teotihuacan, unlike many contemporary cities in Mexico). Major expansion in population and housing occurred between 250-450AD. As many as 200,000 inhabitants have been estimated and at least 2000 “houses” counted. Most of these buildings were home to large family groups or artisan communes. There were even delegations from other cities – a group of craftsmen from Monte Alban is known to have shared a workshop here. The prosperity continued to 650AD and around this time it was the sixth largest city in the world. However, in 650AD, a great fire swept through the city, devastating many communities. For some unknown reason a swift decline ensued and there was no massive reconstruction exercise. Several theories prevail – invasion from a rival city taking advantage of temporary weakness, or a culmination of the erosion of natural resources by over-exploitation. Whatever the cause, the population soon moved to other growing cities and Teotihuacan was virtually deserted. By the time the Aztecs arrived on the scene, the area was little more than an ancient ruin. To the Aztecs, Teotihuacan was a holy place, where the sun, moon and universe were created. It was they who gave Teotihuacan its name, meaning “The place where men become gods”. They also named the Calle de los Muertos, thinking (wrongly) that the many ruined temples and monuments along the “road” were burial places of early rulers. However, the city never regained its concentration of population. In time earth and grass covered the great pyramids, until they appeared little more than large hills on the landscape. Cortés passed through the area in the 16th century and paid little attention to what structures were visible. It was not until the 19th century that proper excavation and restoration was begun. The Citadel and Temple of Quetzalcoatl. The main entrance and visitors’ center is directly opposite the La Ciudadela (The Citadel). This large sunken plaza was the city’s administrative center; you’ll see the foundations of several rooms and buildings around the perimeter. Its name was given by the Spanish, who mistook the perimeter platform and pyramid remains for a fortress and towers. At the eastern end of the plaza, furthest from the visitors’ center, is the Temple of Quetzalcoatl. On approach you will see a four tier pyramid, with steep steps up the nearest side. This construction completely covered a previous pyramid and temple, but excavations on the eastern side have revealed a section of this original building. To see this, walk around the railed platform. The exposed four-tier (originally six) pyramid has protruding sculptures of serpents alternating with masks of Tlaloc, god of rain and maize. The serpents have plumes or feathers around their necks (Quetzalcoatl being the ‘plumed serpent’) and their bodies curve from the left of the head, ending in a rattle. The Tlaloc masks have corn-cob faces, with big circular eyes and two fangs. Carvings of shells and snails around the masks are earth and water symbols. Originally these would all have been painted in bright colors; green plumes and obsidian eyes for the serpent, white fangs and red jaws for Tlaloc. Some traces of paint can still be seen. Calle de los Muertos. Leaving the citadel, walk up the Calle de los Muertos towards the Pyramid of the Moon. On the left you’ll pass the “Edificios Superpuestos” (superimposed buildings) where excavations have unearthed living quarters below the present level, filled in with rubble in order to build the second stage. 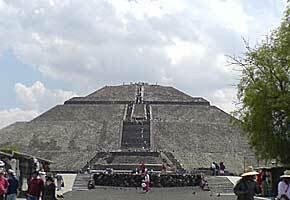 Directly under the Pyramid of the Sun is a tunnel which leads to caves used for religious ceremonies. Early reconstruction work by Leopoldo Batres in the early 20th century has unfortunately removed evidence of the true appearance of the pyramid, including its original height. It is now around 215 feet (65 m) high with five tiers, though the fourth and fifth tier were divided by Batres and there were probably only four original, roughly even tiers. Climb the steps to the top of the pyramid; most of the tiers have small steps that are relatively easier on the legs than those of the Pyramid of the Moon. At the top there would almost certainly have been a temple, of which no trace remains. The view, however, is tremendous and well worth the climb. Directly under the pyramid is the cave system that is believed to have determined its location. An man-made entrance was discovered in 1971 at the perimeter of the pyramid, with steep stone steps cut into the walls of a shaft 23 feet (7m) deep. From the bottom, a tunnel leads to the natural caves, extended to form four rooms. Here various artefacts were found which indicate early use, probably for religious purposes (caves and water sources, which this was likely to be, were seen as holy places). 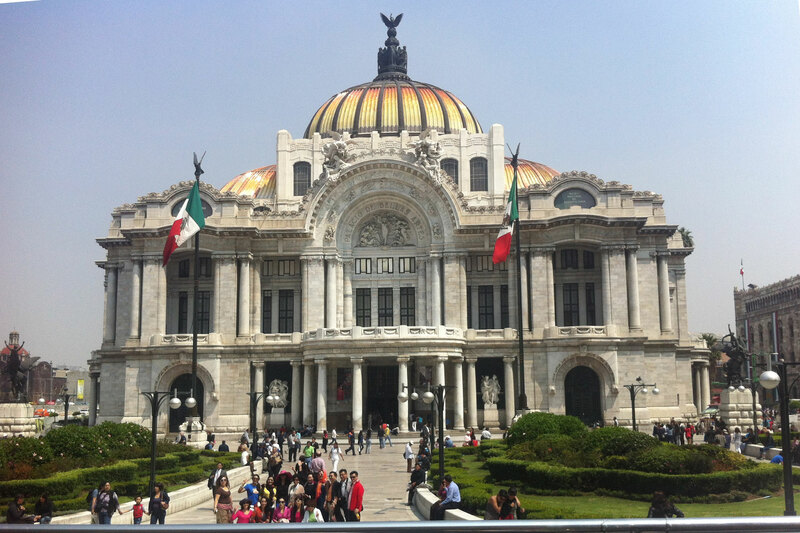 Palaces of the Jaguar and Quetzal-butterfly. Approaching the Pyramid of the Moon from the Sun, a grand plaza opens up at the base of the pyramid. Several platforms and smaller pyramids surround the plaza, each pyramid with a central staircase originally leading to a temple. On the left hand side are the remains of palaces, some with murals and carvings still visible. The Palace of the Jaguar has murals of jaguars with feathered headdresses, whilst in the Palace of the Quetzal-butterfly are carved pillars depicting a hybrid bird-butterfly. The eyes of these creatures were set with obsidian and some still pieces are still intact. These palaces were elaborately decorated and are assumed to have been the homes of high priests. Other murals can be seen in residential areas outside of the main complex; at Tepantitla behind the Palace of the Sun and also at Tetila and Atetelco, west of the main site. Pyramid of the Moon. Although this pyramid is smaller than that of the Sun, it was constructed on higher ground and its peak is roughly at the same height. 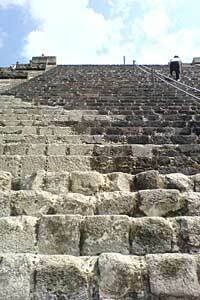 Here there are four tiers, and some of the steps are so large that climbing the pyramid requires much effort. It is worth at least climbing to the first platform though, for the view directly down the Calle de los Muertos is highly memorable.